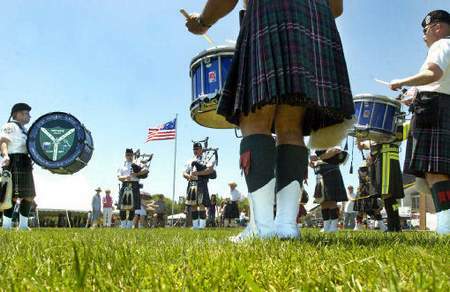 A pipe and drum corps made up of Fort Wayne police officers and firefighters performed Saturday at the 22nd annual Indiana Highland Games and Scottish Festival at Concordia Theological Seminary. Published: June 15, 2008 6:00 a.m.
Haggis is unofficially the official unofficial dish of Scotland, with equal emphasis on both “unofficial” and “official” and each word repeated at least half a dozen times – at least according to Elliot MacFarlane. MacFarlane works for the National Trust for Scotland and led a how-to demonstration on haggis making Saturday at the 22nd annual Indiana Highland Games and Scottish Festival at Concordia Theological Seminary. The annual games celebrate all that is Scottish, including games, music, dance and food. After gruffly calling in an audience, MacFarlane growled a greeting to a group of young children who moved in close. “You there, back up. I don’t want you to get any guts on you,” MacFarlane said. While no living sheep was harmed in this haggis-making demo, one cute stuffed sheep named “Bob” (or “Baaa-b” as MacFarlane said it) somehow went from grazing happily in a field to belly-up in a kitchen. “Some things happen to Bob between the field and the kitchen,” MacFarlane said. The “ingredients” for the recipe, all fashioned from fabric, were pulled by MacFarlane from Bob’s belly, as well as the large and small intestines. MacFarlane said while the intestine is an acceptable ingredient in the American hot dog, it’s not acceptable in Scottish haggis. What did go into the haggis were Bob’s heart, lungs and liver, with MacFarlane saying kidneys are optional though not his preference. After the organs are mixed with onions, good Scottish oatmeal, beef fat, salt, pepper and sometimes garlic, the mixture is tucked into the sheep’s stomach and cooked. “A good haggis meal will feed five, six or seven adults,” MacFarlane said. Haggis-making was the second blood-and-guts demonstration MacFarlane did early Saturday afternoon. Earlier, MacFarlane trained six children in mid-18th-century warfare, using fake muskets, pistols, swords, dirks and shields. It was 5-year-old Riley Brincefield’s first stab at warfare. When asked what she liked best – the weapons, the running or the chance to shout at the boys who also participated – Brincefield’s answer was quick. 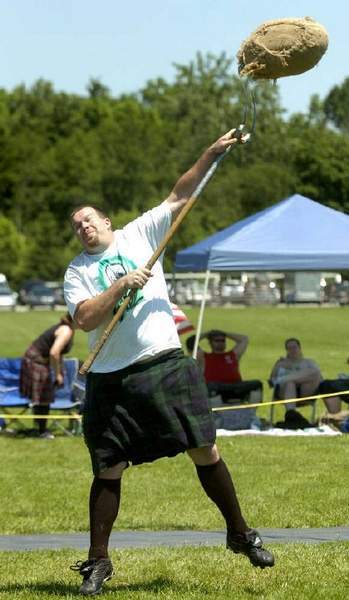 Jeremy Gillingham of New Haven uses a pitchfork to heave a 16-pound bag filled with twine during the sheaf toss. The object is to toss the bag over a bar suspended 24 feet above the ground. 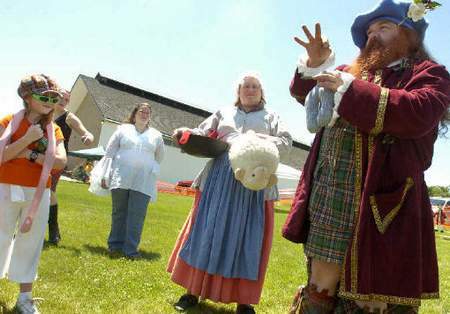 Elliot MacFarlane, right, and Karen Wood, holding the plush sheep, Bob, demonstrate how haggis is made. Zara McCord, 7, watches the demonstration.